More Winners for Green Energy Challenge in Poster Competition! In addition to the four finalist presentations, Green Energy Challenge jurors also evaluated submissions from all 18 NECA Student Chapter teams who entered this year’s competition. Each team was invited to display their submission on a single board, including those who didn’t make it to the finals. Southern Polytechnic University won first place in the poster competition, followed by Purdue University in second and GEC team winners Youngstown State University in third place for the competition. 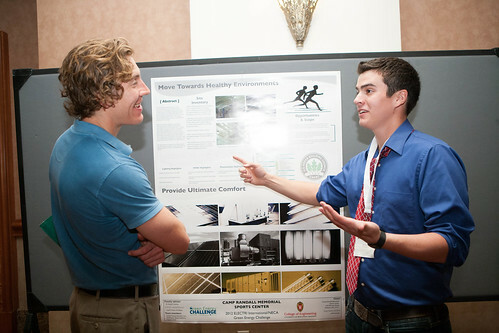 Full details about the 2012 Green Energy Challenge competition guidelines and scoring can be found online. 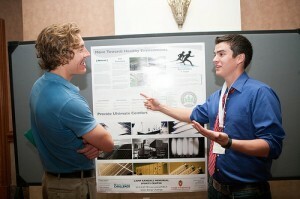 Along with new technology, NECA 2012 Las Vegas will feature new talent – enthusiastic members of NECA’s student chapters from 27 universities, all looking to connect with NECA contractors. Here’s how you can meet them at the convention. The 2012 NECA Student Chapter Summit will convene on Sunday, Sept. 30 from 3-5 p.m. Contractors are invited to drop in during the summit for a spin around the Speed Interview and Networking Session. You’ll get eight minutes to meet with the students to discuss possible internship and mentoring opportunities. Students will come with their resumes and questions about the skills managers look for; contractors should come with business cards and career advice. These students will be the next generation of NECA contractors, and they are eager to learn what skills will help them in the electrical construction industry. Please consider stopping by the Student Chapter Summit to meet the students your chapter has partnered with, plus others from around the country. The teams will make their presentations in Las Vegas on September 29 immediately following the 2012 NECA Energy Forum. Each team is made up of construction management and engineering students who participate in their university’s student chapter of NECA. This year marks the first time four finalist teams have been chosen, as opposed to three. The three finalist teams from the University of Washington, Milwaukee School of Engineering and Youngstown State University are making their presentations for the final round of judging in the Green Energy Challenge at this very moment. The winner will be announced tomorrow at the NECA Student Chapter Summit. No word yet if last year’s winner University of Washington will be making a sweep, or if one of the two upstart teams will win this year. Competition is a great way to learn and focus student careers on electrical construction. So it was a real a nail-biter when we convened the first round of judging for the Green Energy Challenge last month to select the three finalists teams that will present their designs at NECA 2010 Boston. Last year, University of Washington took first place. UW will be returning as a finalist this year, but they will be joined by two teams new to the competition — Milwaukee School of Engineering and Youngstown State University. We had 13 teams enter the competition this year — nearly double the number of teams that entered the 2009 Green Energy Challenge! Teams were asked to conduct an energy audit of a local a manufacturing facility. They had to do provide information for everything from a PV analysis to a financing plan. It’s so great to see the kind of work and attention to detail that the students put into their reports. I am fortunate to get to see first hand what kind of talent we have entering the industry. Now that we know who the three finalists will be, I can hardly wait to hear what they have to share about their projects in Boston. The suspense and enthusiasm is great for the industry. I hope you’ll make plans to hear what these talented young people are planning for their future in it!